“Public blockchains with high performance and support for general application development are generally ranked high,” says CCID. China’s Center for Information and Industry Development (CCID), working under the country’s Ministry of Industry and Information Technology, has recently published the eighth issue of its Global Public Blockchain Technology Assessment Index (GPBTAI). The CCID has ranked 34 blockchain projects this time, an addition of one project – Ontology – to the last issue. EOS triumphed the list for the seventh consecutive time followed by Vitalik Buterin’s Ethereum. Though in terms of applicability, the smart-contract leader has no match (with a score of 28.8), it lags behind EOS in the basic-tech index. The CCID first published its ranking this year in May, and since then, has been updating the list every month. Although the details of the ranking process are not known, the agency uses three indices – basic-tech, applicability, and creativity – to come up with an overall score. It is to be noted that the original cryptocurrency – Bitcoin – is nowhere near the top and lingers around the midway at the 18th position. “Its main network was launched in June 2018. 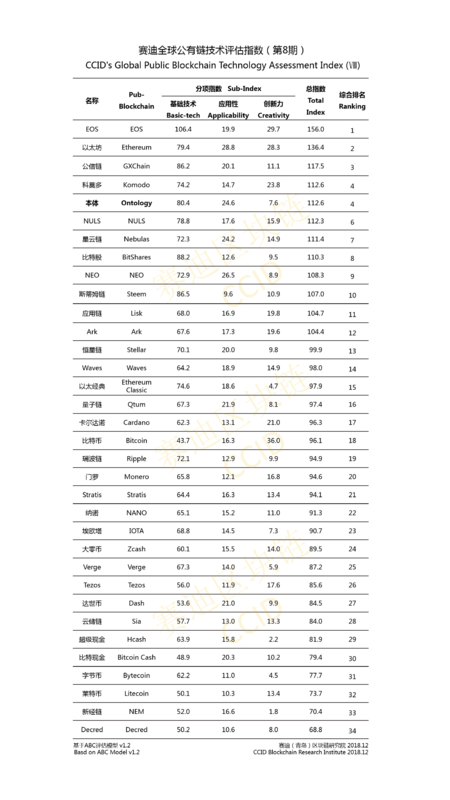 In this assessment, Ontology has outstanding performance in basic technology and application, with a composite index of 112.6, ranking 4th in the list,” the CCID noted.